There’s something happening this Sunday. Something that hasn’t happened here in 2 years. Something I’ve mentioned several times in the past because of the great impression it left me the last time it was here. I’m talking about COCHON 555, BABY. Let’s all do this… to ourselves! As a little background, Cochon is a touring show, part education on the virtues of the most delicious of animals (besides the giant tortoise, apparently), and allowing chefs to REALLY show off. And when I mean show off, I mean they SHOW THE FUDGE OFF. 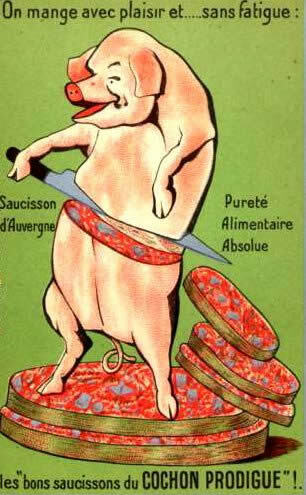 I’m hearing rumors of Fernet Branca ice creams, re-vamped Bahn Mi, and last time around there was an all-ham hamburger. Not to mention the general meat-artisans that are part and parcel to the whole spirit of the event. Everything from the humble Berkshire chop to the grand 4+ years aged jamon Iberico de Bellota (a Spanish wild boar breed that roams wild and feasts on acorns) will be represented in the most gleaming of light. While there will be many of the regular suspects around, there will be just about as much out of state chefs. And, in keeping with the stereotype, there will be the obligatory guys with big beards and/or pompadours. We’ll be looking like a regular mini Portland (OR RATHER PORKLAND HAHAHAAHAHAHAHA I’M SO CLEVER). I’m telling you guys, of all the food events I’ve been to, this is the one I couldn’t find fault with. Very much hoping it will be just as good now that it has returned.